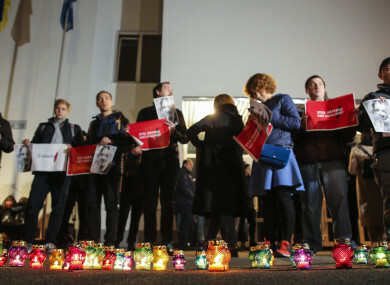 Hundreds of people turned out for a vigil at Kiev's Internal Ministry. UKRAINIAN ANTI-CORRUPTION campaigner Kateryna Gandzyuk, seriously injured in an acid attack in July, has died in hospital, supporters and the government have said. “Katya (Kateryna) is dead. Details will be available in a while,” posted a Facebook group that publishes updates about Gandzyuk’s health and news on the investigation into the shock attack in the ex-Soviet country. Ukrainian President Petro Poroshenko confirmed the news and offered condolences to Gandzyuk’s relatives at a meeting with representatives of the Ukrainian community in Turkey’s Antalya, where he is on an official visit. Johannes Hahn, the EU commissioner responsible for bloc enlargement negotiations and neighbourhood policy, said he was saddened by the news from Ukraine. “Attacks against civil society activists are unacceptable,” Hahn tweeted. Gandzyuk, 33, who worked as an adviser to the mayor of Ukraine’s southern city Kherson, was leaving home early on the morning of 31 July when a man poured about a litre of acid over her and ran away. Gandzyuk was immediately hospitalised in a serious condition, with burns on 30% of her body, including her upper torso, arms, and face. Gandzyuk was an outspoken critic of corrupt practices in law enforcement agencies, particularly the police. The country has seen an increase in attacks on anti-corruption activists and campaigners. Journalist Pavel Sheremet was killed by a car bomb in 2016 while driving near his home in Kiev. In 2017, the stabbed body of human rights activist Iryna Nozdrovska was found in a river outside Kiev. In July, Vitaliy Oleshko, a former volunteer fighter in the rebel Ukrainian east and a local activist, was shot dead outside a hotel in the southeastern city of Berdyansk. Email “Ukrainian anti-corruption campaigner who had a litre of acid poured on her during attack dies ”. Feedback on “Ukrainian anti-corruption campaigner who had a litre of acid poured on her during attack dies ”.